I’ve seen this trialled on the LUSH Southampton instagram, and to be honest, I’m a sucker for bright colours and I loved the fact that the eye floated in the middle of bath for a bit. So when I wandered into the shop, this was already on my shopping list. I’m a big bath bomb fan, and it smells fantastic! It also left my skin feeling super soft! This was my favourite scent out of ALL the products I bought. It smells AMAZING. I suffer from dry lips thanks to my obsession with matte liquid lipsticks, so I’m always on the lookout for products which will make my lips softer. I actually preferred this lip scrub to the Honey Lip Scrub Pot, mainly because it smells amazing and is much easier to access with my acrylics! I’m a big fan of the bubble bar. Unlike with the one use only bath bombs, you can break bits of the bubble bar off and you can use it for 2/3 baths which I love. This as such a refreshing scent and I really love using it first thing in the morning as it wakes me up! It has hints of lime, juniperberry and grapefruit and it smells divine. As with most LUSH products, it also left my skin super smooth. Much like the Sparkly Pumpkin bubble bar, I loved using this product. It left my skin smooth and shiny and it’s a fantastic looking product! If I’m honest, I preferred the scent of the Sparkly Pumpkin Bubble Bar as this one is quite floral with hints of jasmine and geranium, but I’d definitely still repurchase. I’ve never used a shimmer bar before and I was really intrigued by the goth fairy shimmer bar. I’m obsessed with anything shiny, a bit like a magpie, so I was drawn to this because of the promise to make me shimmery and glitter and boy did this not disappoint- it left my skin soft and shimmery! It also smells so sweet and sugary- strong notes of blackcurrant and I’m a lifelong Ribena addict so this was always going to be a winner. I’d definitely use this before a night out. 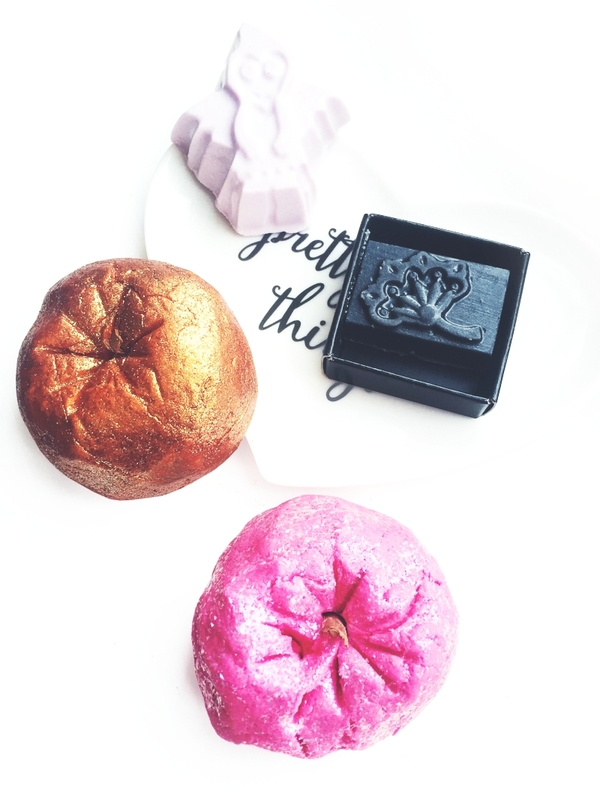 This has been my first ever guest post, so thank you to Alice for asking me and giving me the opportunity to guest post on her amazing blog and if you enjoyed reading this post about my LUSH haul, you can find more like it here. What are your favourite Halloween products? Have you used any of the above? Let me know! This is a guest post written by Molly over at mollyrees.com. All comments, images and opinions are strictly her own and do not reflect the views or intellectual property of Dainty Alice. Great first guest post, Molly! I'm not returning to the UK until after Halloween so I hope they still have some of these products in stock! Great guest post Molly �� I’ve seriously been loving rose lip scrub as well! I also love the monster bath bomb so so much!